INTEGRATED’s software programs are leading cable modelling software programs that allows the designers to model a variety of electric or magnetic effects in cables simulation. Calculation of Electric field strength and voltage distribution. Calculation of capacitances. Calculation of Power losses in insulation. Calculation of Electric field strength and voltage distribution in time. Heat transfer, Temperature distribution inside cable. 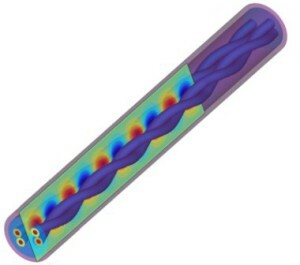 Cable heating system simulation. In cable designing simulation, calculation of RLCG matrices are very useful (e.g. for cross-talk simulation). For this, it is possible to combine the ELECTRO and OERSTED modules into a single program, which combines the Circuit Parameters mode of each. The table below provides the suggestions on simulation software programs for different types of analysis in cables.